The Arduino Yun and grove sensor as part of the main IoT Command Center, are used to post temperature , Humidity and Air Quality in the house,based on which various rules are created in the ARTIK cloud to control Hue light bulbs. And a Raspberry Pi A+ is used to create a Key Less door entry mechanism, which sends data for the ARTIK cloud to turn On/Off the lights at home and save energy. 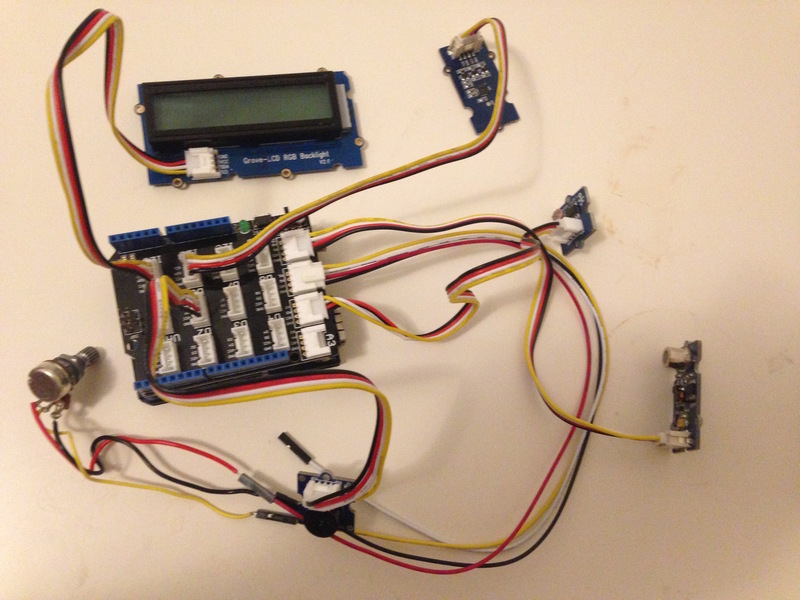 Once you have logged in create an application, under the Dashboard --Application , I am calling mine "YunHomeAutomation"
Once done Create a new Device Type called - "ArduinoYunHome"
Now login to https://artik.cloud/my/devices , and use the connect another device to add the Device type you just created in the above step . Also add the Phillips Hue as a device using the connect another device , here you will see a configure button which will ask for your Phillips Hue account details. Upload the code attached below and you are now done with you setup of the IoT command center , open the Serial monitor to test and also check out the data log section under my Artik cloud -> Data Logs to verify the the sensor values are logged. Now we are going setup a couple of ARTIK cloud rules to test our setup as shown in the video below, basically when we move the potentiometer dial to one end, we will post data to ARTIK cloud, which in turn will trigger a rule to turn on one lamp and the color of the other hue light to blue. And when the potentiometer dial is moved to other direction we will turn off the one lamp and turn the color of the other light to red. select the Office Lamp to turn seton. Connect the GND pin of the Pi to GND pin of battery pack and the servo. I am also using a 1K ohms resistor to protect the GPIO pin from unexpected high current . To add the 3D printed parts to the door knob, you will have to remove the existing door mechanism, and also remove the metallic rod just behind the open/close knob,.We will use this metallic part to add to the 3D printed part which will then connect to the servo horn. Link to the servo motor used - Standard Servo Motor (4.4KG*CM) and here is the link to mini breadboard which fits nicely in the Pi A+ enclosure.In addition as part of the setup , as you see in the pictures above I am using a 4AA batteries to drive the servo, but as part of the final setup I plan to use a USB cable cut at one end. Create a new Device Type called - "PiKeyLessDoorEntry"
Basically , set the Hue Light to ON when the door is opened and set if to off when the door is closed. As part of testing the code you will need to enter a password to open the door , as part of the code it is setup as "artikpi" and yes! you phone/tablet will have to be connected to your home WiFi to get to the web app. int loops=2;//changes when sensor value is displayed. if (current_quality >= 0)// if a valid data returned. # We send random values to the 'temp' field for this FireSensor. # Let's send a random value between 0 and 200 for this demo. part of the flask App for the Key Less door entry mechanism, create a folder call templates in the webapp folder and place this file in it. Modify your deviceId and deviceToken details. Create a folder called config in the webapp folder and place the file in it. File need to be create in the webapp folder on the Pi.Also remember to install the ARTIK cloud python library before running this file individually for testing..